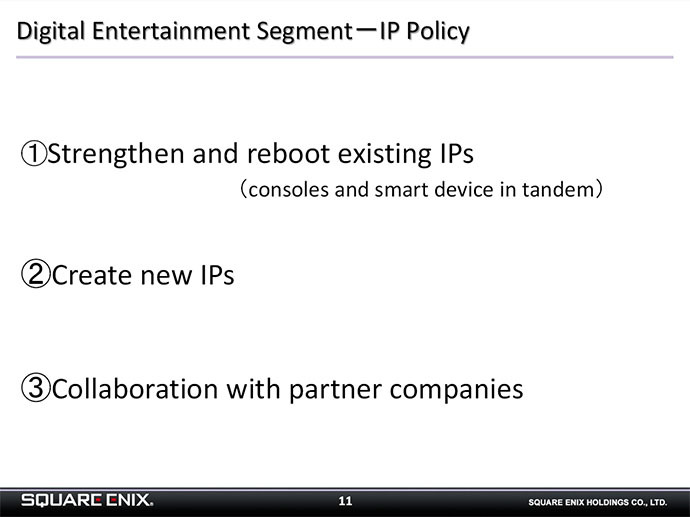 There are three key IP policies. First is to strengthen and reboot our existing IPs. We would like to focus on how to utilize the numerous assets of content that we have nurtured so far, and apply them to the latest trend. As for the platform, we would like to use consoles and smart devices in parallel. Just focusing on one platform is not enough. We believe it is significant to serve both platforms, if we are to offer game content and services that appeal to the new generation. The second policy is to create new IPs. I cannot disclose much at this moment, but we are working on various initiatives, including some experimental projects. So far, we have created IPs for a wide range of platforms, including consoles, smart devices, PCs and publication. Based on this strength, we will actively work on creating new IPs in FY2016/3. The third IP policy is to collaborate with partner companies. With so much changes going on in the market, we will suffer a big opportunity loss if we try to do everything all by ourselves. Through collaboration, we will utilize the strengths of other companies which we ourselves lack, and grow the size of the business. A good example is &#8220;DRAGON QUEST HEROES,&#8221; So far, we had not worked on a full-scale action RPG. However, we were able to create a new style for &#8220;DRAGON QUEST&#8221; through collaboration with Koei Tecmo Games. Based on this success, we want to collaborate more with partner companies, both in and out of Japan. We plan to make use of our IP in multifaceted approach, in &#8220;DRAGON QUEST HEROES&#8545;,&#8221; and &#8220;STAR OCEAN 5,&#8221;, as part of the efforts to strengthen and reboot our existing IPs, as I mentioned earlier. I can already feel that FF XII HD remaster. Reboot and strengthen existing IPs like The World Ends With You, right. Collaborations can be cool; it'll be interesting to see what they have planned. So... reboot Eidos titles on Consoles, and S-E titles on Mobile? It'll be interesting to see what companies they work with in collaborating projects. They already have Team Ninja working on Dissidia along with Dragon Quest Heroes with Koei Tecmo. Rise of the Tomb Raider is only listed for Xbox One in that report. Xbox 360 version cancelled / not coming this holiday? 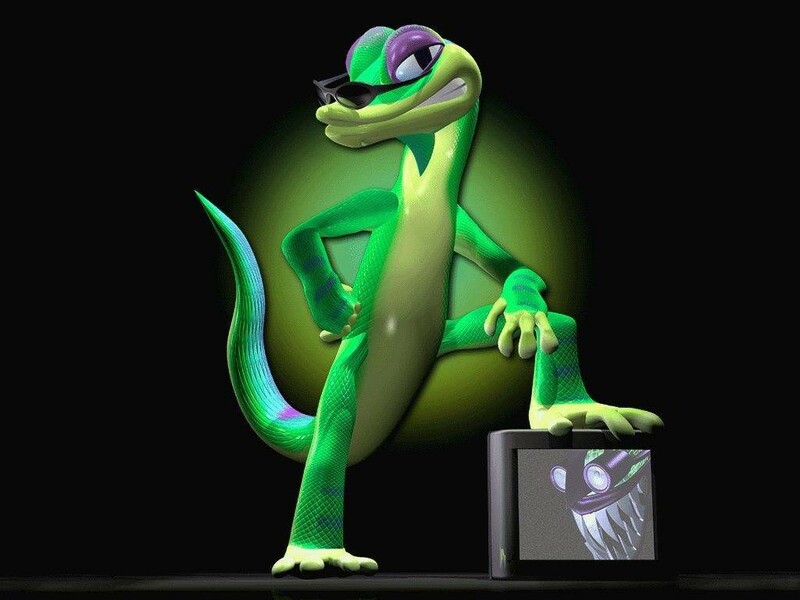 Bring gex back square enix! A new Secret of Mana would be nice. Good, now give me my Legacy of Kain. I've only read the linked page, but this stood out to me. Taking TOMB RAIDER, as an example, we released the GOTY (Game Of The Year) version, the HD remaster version, and the complete version including PDLC, following the first launch of the title. By conducting sales activities not once but two or three times, revenue contribution is becoming more long tailed. They are also collaborating with Team Ninja for Dissidia, right? SE is off to a good start this gen, I'm really looking forward to their games. Backing both horses is also a smart idea instead of just focusing on mobile like the trend is in Japan right now. Well, I know where they should start. Why are strippers at the U.N. bad when they're great at strip clubs??? It has to be. They talk about Just Cause 3 in it. Hopefully, by the time Tomb Raider comes out the 360 will be over 10 years old. Dissidia would count as a collab with Sony right? As for the platform, we would like to use consoles and smart devices in parallel. So does that mean no more new console Title (FF XV etc) for PC ? Soul Reaver: Shadow of Mordor Dead Sun finally seeing the light of day? It had to be said. I didnt feel like adding another game to my backlog so I started watching all the cutscenes on youtube. But it was so interesting i had to stop. Regular PC games are lumped in with consoles for them on that front. Browser games are lumped in with smart devices. I believe on of their producers implied a console Manager game was in the works too. wouldn't be such a bad idea, have a small budget for it. i mean the people have spoken with yooka laylee, people want 3d platformers that aren't just mario games. Are they bringing back Championship Manager? Reboot huh. I wonder how a new Chrono a Trigger would pan out, new world (a la Final Fantasy games) and characters but with time travel through multiple eras as the central device. I'd be down for that. Just let Nintendo have Chrono Trigger, I don't care what you do with the rest of yourself. Not really, they are just letting people know that both console level and mobile games are being made. Doesn't mean there won't be ports to PC at some point. Came here to say this. And none of that Dead Sun nonsense, either. I will pointlessly express my desire for Super Mario RPG in the 3D World engine in every thread I can. Parasite Eve would be a FANTASTIC reboot. Alright thanks, just odd considering the header on their IR website; hence my confusion. Valkyrie Profile 3: Hrist and Radiata Stories 2 please. On 3DS, with StreetPass functionality? Nnng. Like with TO PSP, I'd really hope they got Matsuno to come back and assist. Same with a hypothetical FFXII IZJS on PS4.